In this article you will get the answer! I will show you my top 10 Raspberry Pi cases for model 3, 2B and B+ which are way more than just a box and give your Pi a personal style. Your Raspberry Pi CPU gets too hot because of your applications? Or do you want to have your Pi on long-term usage? Then you should think about a Raspberry Pi case with a fan and even get some aluminium heatsinks. For normal usage the Pi should not heat up but if your application needs more computational power the CPU can get really hot, which can break your Pi in a worst case scenario. Cases with a built-in fan blow fresh air inside for a better air circulation. Besides the fan can be powered by the GPIOs. You can find this case here (US / UK). If you have already another case I really recommend to use at least some heatsinks (US / UK). On each of my Raspberry Pi’s I use two adhesive aluminium heatsinks. A package of three pieces is about $2 / £1-2. Another nice common case is the official case of the Raspberry Pi Foundation (US / UK). In the first years they only sold the Raspberry Pi models but nowadays they are also focussed also on other accessories (like the wifi dongle). It was designed for model B+ but because the Raspberry Pi 3 / 2 model B has the same dimensions, it can be used for all of them. Its surface is smooth and relaxing. To connect jumper wires to the GPIO header you can remove the top cover. This basic white-raspberry colored case is $10 / £8. There are several touchscreens (US / UK) available which work or are designed for the Raspberry Pi. Although often you need to install a lot of software until you can finally use it. A case with an integrated lcd touchscreen was a long-time-desire from Raspberry Pi lovers. Finally, here it is (US / UK). The advantages of a Raspberry Pi lcd touch screen case are obvious. You can put it on top of your Pi and it uses the GPIO header. The touchscreen is even compatible with the Raspberry Pi’s of the first generation and, of course, also with all other models such as A+, B+, 2B and the Raspberry Pi Zero model. On all models with a 40 pin header you can still use the remaining 14 GPIOs. The screen size is 3.5 inches which is comparable to smaller smartphones. If it would be larger the screen would not fit on top of the Raspberry Pi. This case with removable touchscreen is $40 – 45 / about £35-40. If you don’t know how to use this case: You can stick a battery / power bank on the back and enjoy your portable handheld Raspberry Pi case. Maybe you are one of them who like to have more than just a 3.5 inches touchscreen. There is a really nice 3d printable case where you can put in your Raspberry Pi Model 2B, a battery and thea official touchscreen display (US / UK) and have a 7 inch tablet. In my opinion a Raspberry Pi can be a much better tablet for enthusiasts than an iPad, because you have much more options to individualize. With a 2500mAh battery (US / UK) the uptime will be about 3 hours, depending on your usage. The only shortcoming on this project is its width: 3cm is more than other tablet’s width. As well as for any other case the ports are accessible. You can find the files for your 3d printer and even more information on Thingiverse. On Thingiverse there are also a lot of other downloadable case files. If you have a 3d printer you can make your own individual Raspberry Pi case in your favourite colors. With online tools like Tinkercad it is very easy to create 3d objects or to modify existing models. In the slideshow above you can see some of my favourite 3d printable cases: Two of them (pirate / striped case and a squared case with rounded corners) are “just” good-looking cases but without further functionality. Otherwise with a joystick, some buttons and a touchscreen display you can make your own Raspberry Pi “GameBoy”. There are several options to use Nintendo ROMs on the Pi. If you are interested in this project take a look at RetroPi. The last image shows an attachment for your Pi with that you can use 50mm fan (US / UK) on top of your Pi. So if your Raspberry Pi gets really hot and you need a big CPU fan, this is worth a shot. Finally, if you really want something individual, a 3d printed case is a great option. If you also have other great 3d printed cases, please write a comment. If you don’t like to buy one, you can even create a self-made wooden Raspberry Pi case. Because of its GPU acceleration the Raspberry Pi is a popular multimedia center. KODI transforms your Raspberry Pi into an smart TV alternative, which let’s you stream YouTube videos, play movies and audio files or surf on the internet. There is a lot of equipment on the market, like infrared receivers and remote controls. If you are interested or already running a Raspberry Pi with KODI, you should check out the MEDIAPI multimedia case (US / UK). This case combines all useful parts for a media center. It has a 5 port USB hub (2x front, 3x back), a power switch on the back side of the case and also an infrared receiver on the front. Inside there is space for a 2.5″ HDD and for a Raspberry Pi B+ or 2B. Moreover it comes with an IR media remote control and power supply adapters for the US, UK and europe. For all those, who don’t have much experience with the Raspberry Pi, there is a guide for assembling included. Another stylish case with cooling effect is this very sturdy case consisting of aluminium (US / UK). Besides a vent under the GPIO header it comes with an integrated fan for a better air circulation, which is powered by the 5V pin of the Pi. Moreover you can put a heatsink on the CPU. 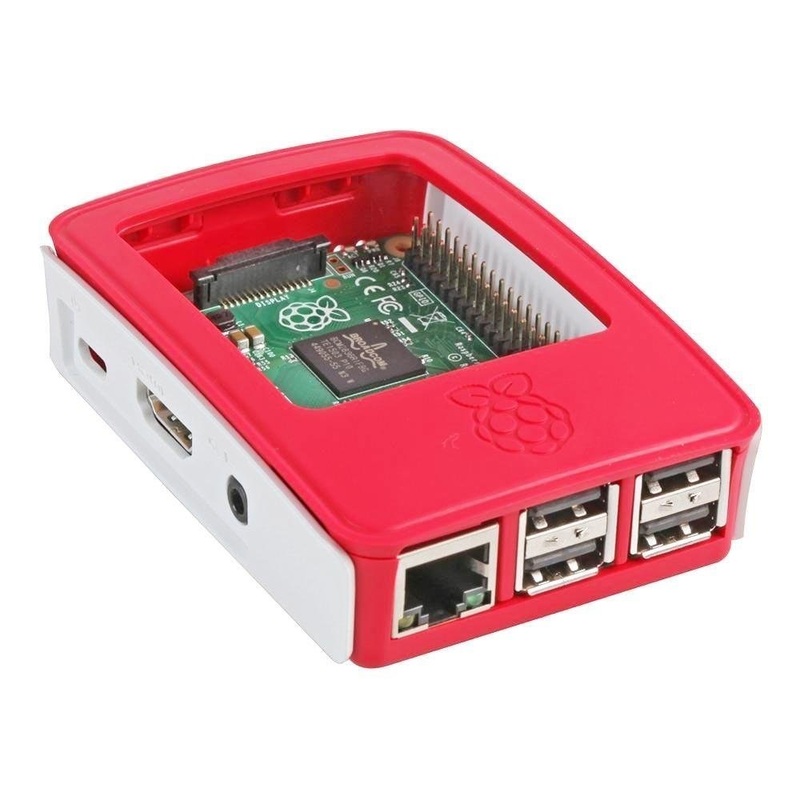 The side panels of the case are screwed on the shell after you inserted your Raspberry Pi into it. On the bottom plate there are two screw holes to fix your Pi. After you finished all those steps, this is one of the most stable cases I know. Due to its unique style it’s a bit inconvenient to access the GPIO’s. You have to lay a 40-pin ribbon cable through the opening on the bottom plate. But if you have no hardware related projects (e.g. FTP web server) this case it definitely an eyecatcher! If you have more than one Raspberry Pi you maybe thought about connecting them. A lot of people build server clusters for parallel computing. The advantages are obvious: A Raspberry Pi is one of the cheapest computers on the market but not the most powerful. Now, if you combine several Pi’s, you get computing power than a normal PC would have. Without ordering your server farm, it can end up with a mess. This is where the stackable cases for Raspberry Pi’s come in. You can stack several single-board computers on top of each other (two or four or …), no matter what type your Raspberry Pi is. This enables you to combine all Raspberry Pi models (except of model Zero) in a server cluster. The stackable transparent cases from GeauxRobot (US / UK) have open sides. This lets the heat dissipate better. If this isn’t enough, you could use a big fan for multiple Raspberry Pi’s coincident. An alternative way would be to use LEGO and build your own stackable cases. Last but not least I want to mention some premium / basic cases. Depending on the project I often use such cases without any considerable features. One of the advantages of this type of case is its price. Usually one is about ($5 to $10 / around £7) and sometimes also heatsinks are included. You can get them in several colors, but I usually prefer clear cases. The reason why I often use those cheap cases is that you can modify it in several ways. Of course, you can also modify every other case, but you are probably reluctant to cut a stylish/expensive case than a cheap one. Rechargeable battery under the case: If your Raspberry Pi should be portable, you need a current supply. There are several USB battery packs (US / UK) with 10,000 mAh capacity and more. Those batteries which have the same measurements as the Pi ( 3.37″ x 2.21″ ) can be placed and connected under the case. Solar panel on top of the case: An additional feature to a rechargeable battery could be a solar module. This project is not that easy but in my opinion very interesting. Although a tiny solar panel cannot fully charge the used battery, a larger panel certainly can. If you are planning a weather station or any outside project, you should think about it. Hard drive case: I already presented you the MEDIAPI case, but maybe those features are too much for you. If you need additional disk space (e.g using a ftp server via your network) you can attach a 2.5″ HDD upon your Pi case. I hope you liked my top ten list of useful cases. If you have any further ideas feel free to comment.